We call it the new AMD FX 6-Core Processor Black Edition and it's unlocked for your overclocking pleasure. Experience unmatched multitasking and pure core performance with the all-new "Piledriver" architecture. Get the speed you crave with AMD Turbo CORE Technology to push your core frequencies to the limit when you need it most. Go beyond the limits of maximum speed with easy-to-use AMD OverDrive™ and AMD Catalyst Control Center™ software suites. But the best part of all? You'll get all this impressive performance at an unbelievable price. You'll be asking yourself "what competition?" in no time. • More speed when you need it. When the job calls for speed, AMD Turbo CORE Technology automatically kicks in, boosting performance to a user’s varied workload. One can never have enough speed. Achieve full processor power potential and dynamic power management, giving you what you need, when you need it. The one and only AMD FX 6-Core Processor Black Edition comes unlocked and overclockable with easy-to-use AMD OverDrive™ and AMD Catalyst Control Center™ software suites. If you thought you were fast, you haven’t seen anything yet. • Ferocious power?right out of the box. 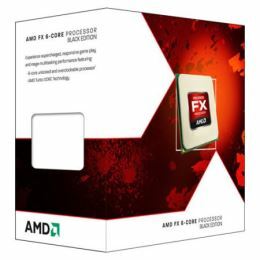 The groundbreaking AMD FX 6-Core Processor Black Editi..